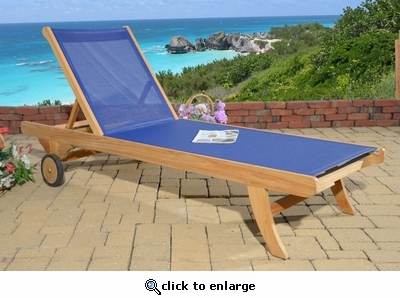 This chaise combines comfort with high quality Teakwood. The sling allows the chaise to be most comfortable even without cushions. The back adjusts to five different positions so you can find optimum comfort. Rear teak wheels are covered with slip-resistant rubber for easy portability. Comes with an easy to clean & beautiful blue sling.